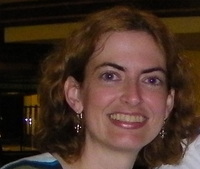 Today I am very excited to welcome author Jennifer Comeaux to the blog for an interview! And now let's hear what Jennifer had to say! When I was a child, I dreamed of being a writer and used to write lots of stories. But as I got older, I stopped writing and didn’t think much about my dream of publishing a novel. A few years ago, I came up with an idea for a figure skating story, and a friend asked me to write it so she could read it. At first, I just shared it with her and a few other friends and family, but then I decided I wanted to try to get it published. For my first book, Life on the Edge, my process was probably a little different from other writers since I started out just writing the story for fun. I would write one or two chapters per week to share with my friends. When I decided I wanted to mold the story into a publishable book, I spent about a year doing major rewrites before I submitted it to my publisher. My second book, Edge of the Past (which will be out this winter), took about six months to write, and that included a lot of time just thinking about the plot and brainstorming. What is your work schedule like when you’re working? I usually write at night. Since I have a full-time job, I unfortunately don’t have any time during the day to devote to writing. I like to hand write in a journal. I find I’m more focused when I hand write instead of type on the computer because of all the distractions the computer can bring. My attention span is miniscule, so I’m easily distracted! I have to be very passionate about something in order to write about it. 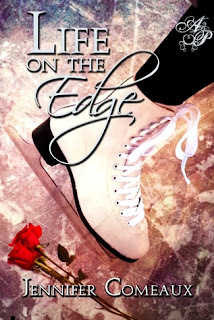 My love for figure skating is what inspired me to write Life on the Edge and now the sequel. All my years of travelling to skating events and seeing the behind-the-scenes world has given me lots of ideas for my stories. My current release, Life on the Edge, is my first published novel. When I was thirteen, I wrote a book, but I don’t know if that counts! Traveling and sports-watching are my two big hobbies. As you can tell from the subject of my book, I’m a huge fan of figure skating. I’m also a big supporter of Tulane University athletics. I have football and baseball season tickets, and during spring you’ll find me at the ballpark almost every weekend. Travelling is my other love, and I especially enjoy travelling to figure skating events. I usually attend two or three per year. My family is very supportive of my writing. They are all so excited about Life on the Edge. My sister helps me brainstorm story ideas and is one of my proofreaders. was surprised how much my writing improved with the help of other writers critiquing my work. I couldn’t have gotten my book published without their help. I had no idea what I was doing when I first started writing the story! Do you have suggestions to help me become a better writer? If so, what are they? I would suggest joining a critique group or website like Critique Circle, where you can get support and detailed feedback on your writing. It’s essential to have another pair of eyes looking at your work. Sometimes as a writer you’re so close to the story that you can’t see things readers can spot. I’ve heard from some readers who have identified with my characters, and I’ve heard from skating fans who’ve really enjoyed the story. It’s been so much fun interacting with readers! I love hearing from each and every one of them. When I write, I don’t really think about a target audience. I just write the story the best way I know how and in a voice that stays true to my writing. It’s been great that Life on the Edge has appealed to both teens and adults. I’m gotten wonderful feedback from both groups! I think the best stories have characters that stay with you long after you’ve finished reading. When you find yourself becoming emotional as you read, whether it’s crying along with the characters or yelling at them, then I think the author has succeeded at writing a masterpiece. While working full-time, how do you find time to do all the research for your books? I was lucky that I didn’t have to do a huge amount of research for Life on the Edge because I wrote about a subject and places with which I was very familiar. Edge of the Past required more research as my characters traveled to Russia, a place I’ve never visited. How old were you when you decided to become a writer? If it was later in life, what gave you the final push? I was thirty-four when I decided to try to get Life on the Edge published. I just wanted to share the story with the world because I loved it and believed in it so much. What do you consider invaluable resources for an aspiring writer? I think the most important resources are critique partners or beta readers. As I mentioned earlier, it’s essential to have someone else read your work and provide feedback. In the end, you have to go with your instincts as a writer, but sometimes you need an outside perspective to help you see the story clearer. Thanks for stopping by and chatting with us Jennifer. It's been so great having you hear and learning more about you! Thanks for the interview! I've never read a NA book with skating as the theme. Cool idea!